And here is the next layer, dripping paint on dry fabric. The paint is thinned with water, so it is wet enough to blend, but you also get some more defined lines when using dry fabric. How wonderful to have beautiful enough weather to be painting outside! Time to get back to painting, and it’s finally nice enough to spread out in the yard! 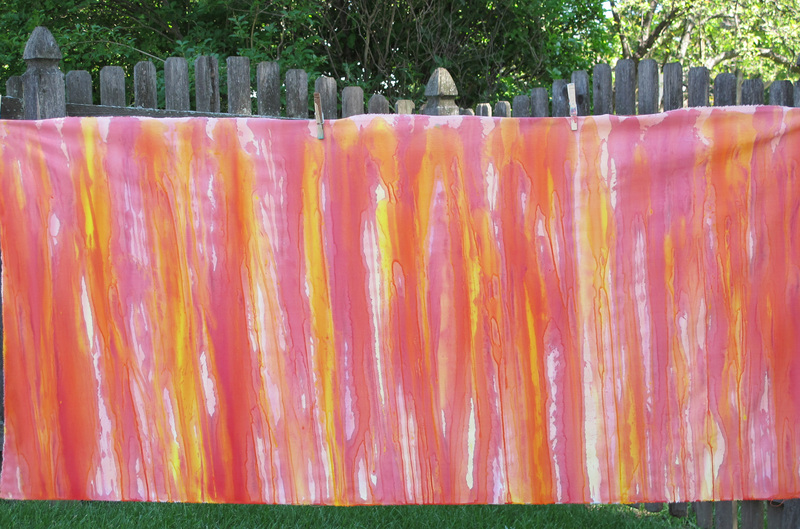 “Dripping” can be done indoors over the laundry tub, but it’s so much more fun outside. I pull a piece of twine across the yard; it’s attached to my fence but you can use trees or whatever is available in your space. Old-fashioned clothes pins hold the fabric. I’m in the beginning (experimental) stages of a series on water reflections from Venice, so dripping seems to be a good place to start. 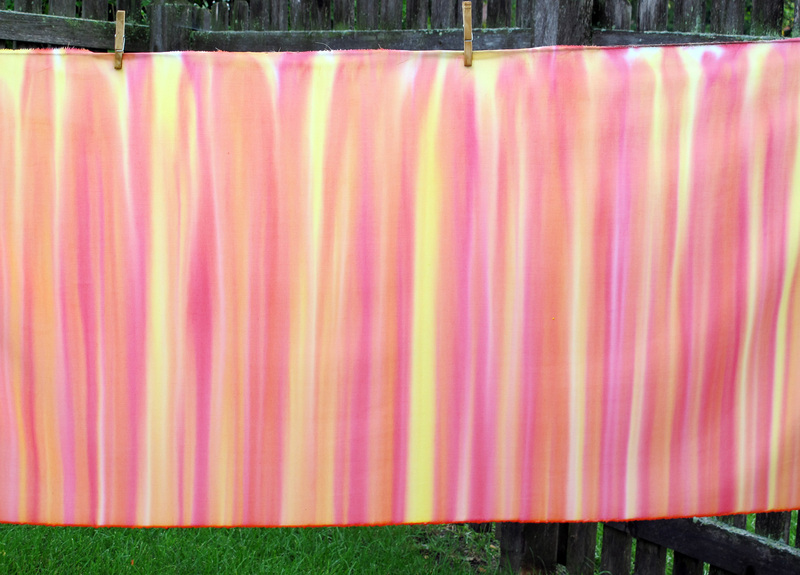 I hang my fabric (background already dyed and painted), wet the fabric and start to apply paint. 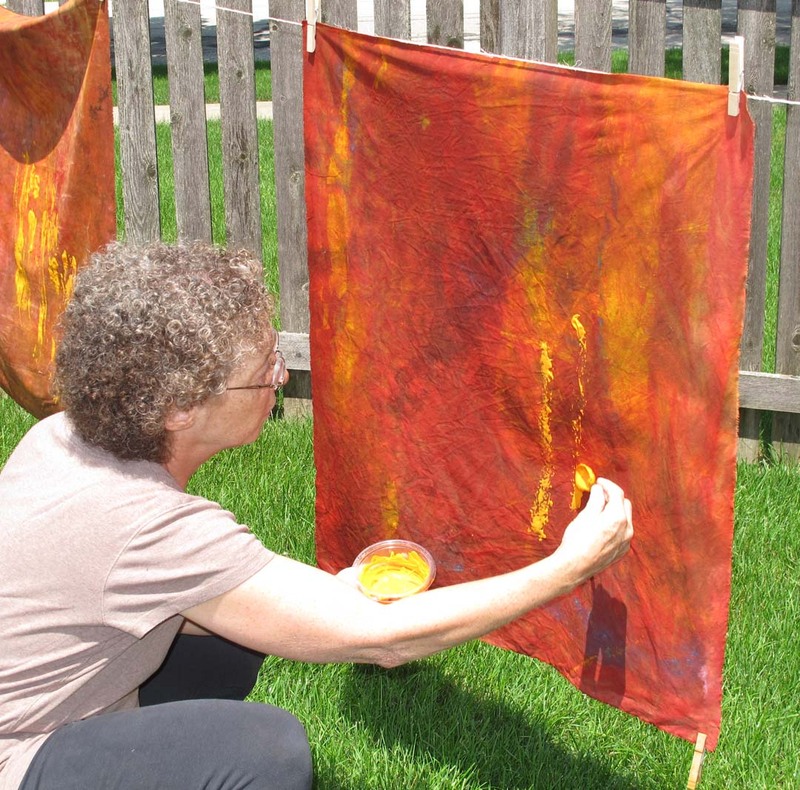 This can be done on dry fabric if you want more defined lines; paint on wet fabric spreads. I’m using a spoon here but also use various sized brushes to apply paint. For even more dripping, spray lightly with the hose. If you spray too heavily here, you can wash off a good amount of paint – nice if you don’t like what you’ve done. Add water to thin the paint, and you can apply it from a bottle; this gives a little more control over the dripping. 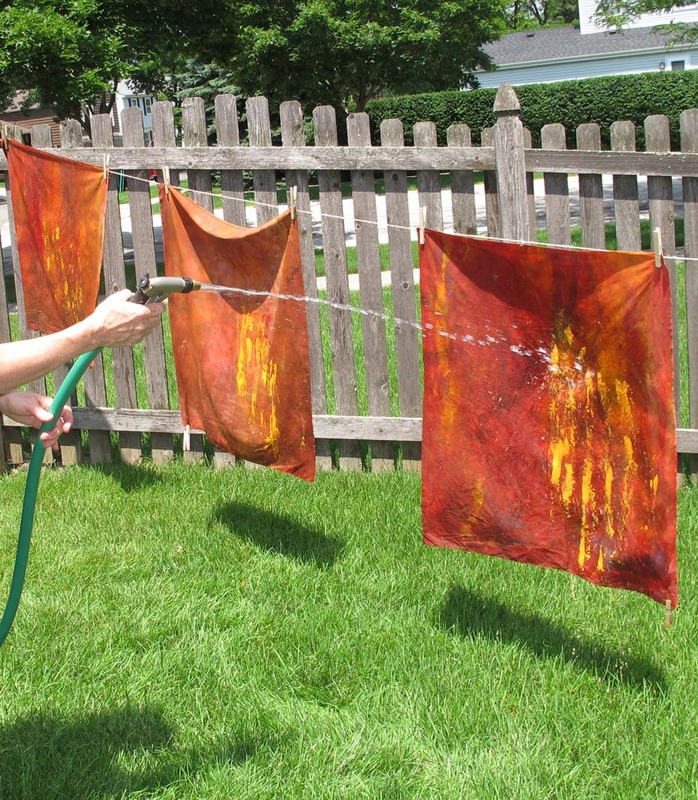 Don’t worry about the wind blowing your fabric – your paint may move around in some interesting ways! Value is the relative lightness or darkness of a color, and it is sometimes more important than the actual hue (color). Value gives a work contrast and gradation; it defines form and separates objects. Value sparks interest. If a piece appears dull, you may need to increase the range of values. The value of any color is also relative to the value that lays next to it; the same value may appear dark next to a light color and light next to a darker color. There a two good ways to determine the value range of a work in progress. You can “desaturate” the image in Photoshop, reducing it to black, white and grays, an easy way to see the lights and darks. Viewing a work while squinting your eyes also helps blur color and define values. An interesting and informational experiment is to take any color and move from the lightest value to the darkest value you can get. 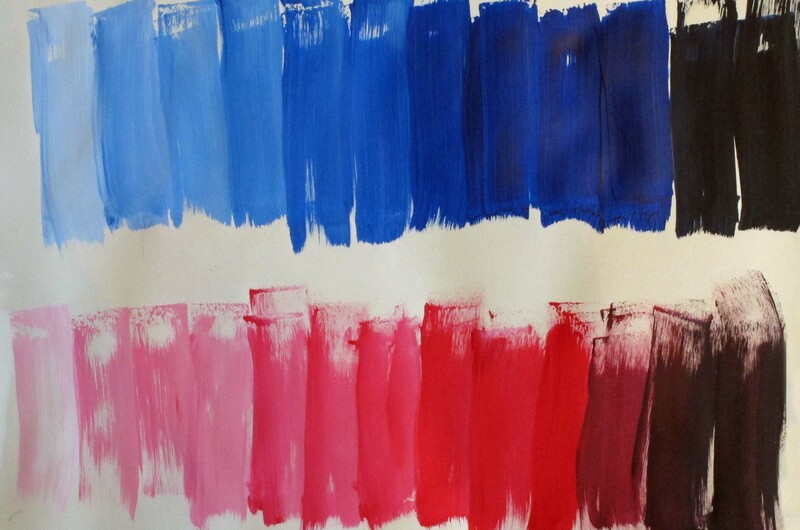 These images show gradations of blue and red. For both experiments, I started with white and added very small amounts of color several times to produce darker values. 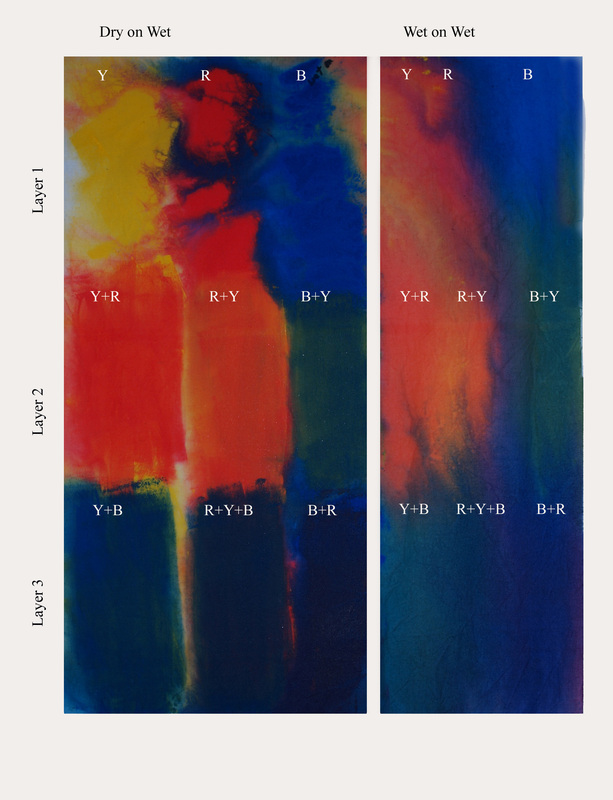 The final three strips of color for both red and blue have increasing amounts of black added to produce still darker values. Notice the range available from one color plus white and black. For this experiment, I started with yellow and mixed in very small amounts of blue for each successive strip to get many variations of green. 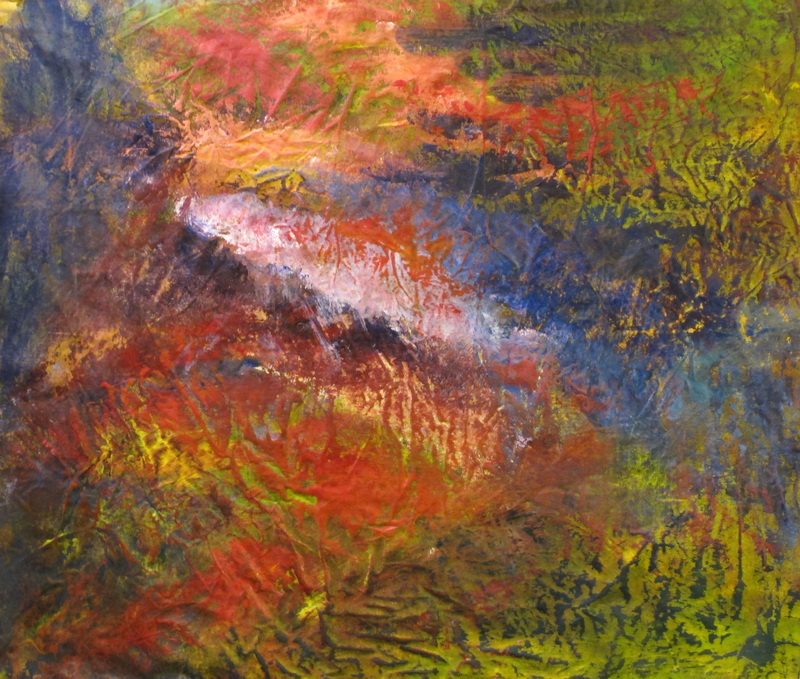 This kind of experimentation will help you feel more comfortable with your paints, and will show their versatility. Go ahead and play! 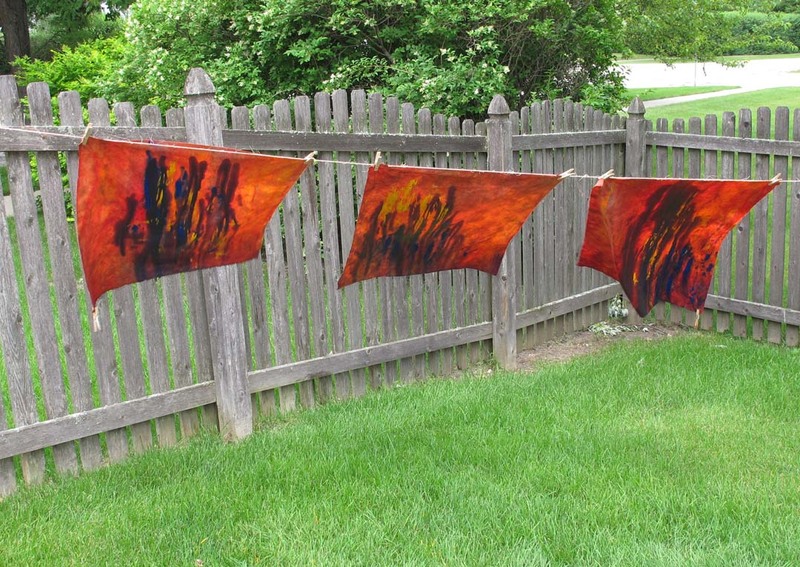 Another way to get lots of texture: Put a base layer of paint on your fabric and let it dry. As it dries, the fabric will scrunch and crinkle (technical terms for sure). 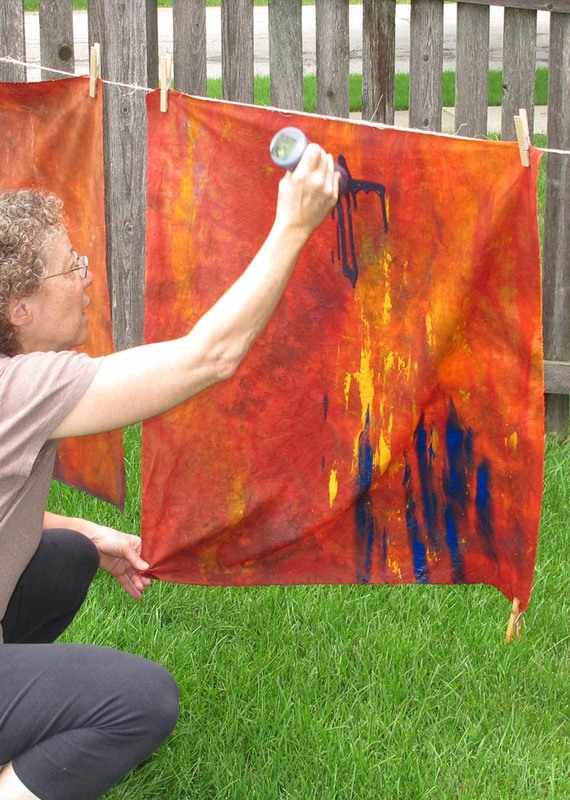 When you apply the next layer of paint on the dry, crinkled fabric, texture happens magically! Start with lighter colors so they can shine through. 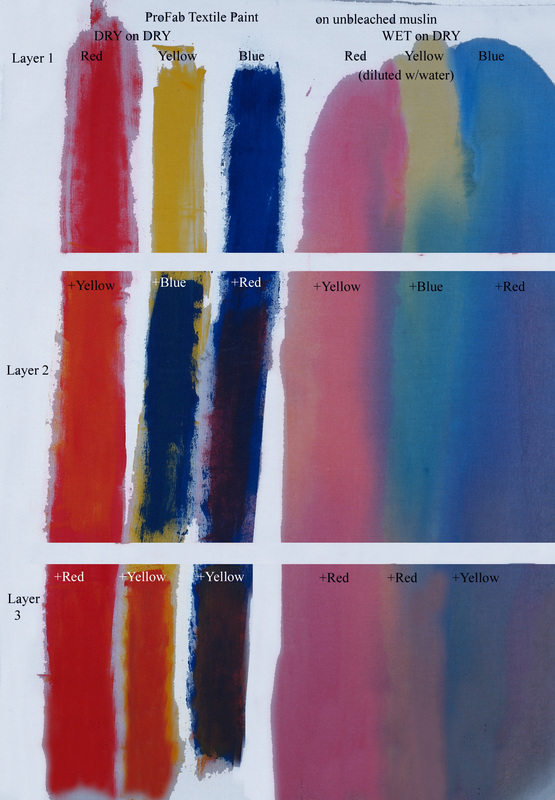 Be sure to wait for the initial layer of paint to dry so you don’t wind up with muddy colors. 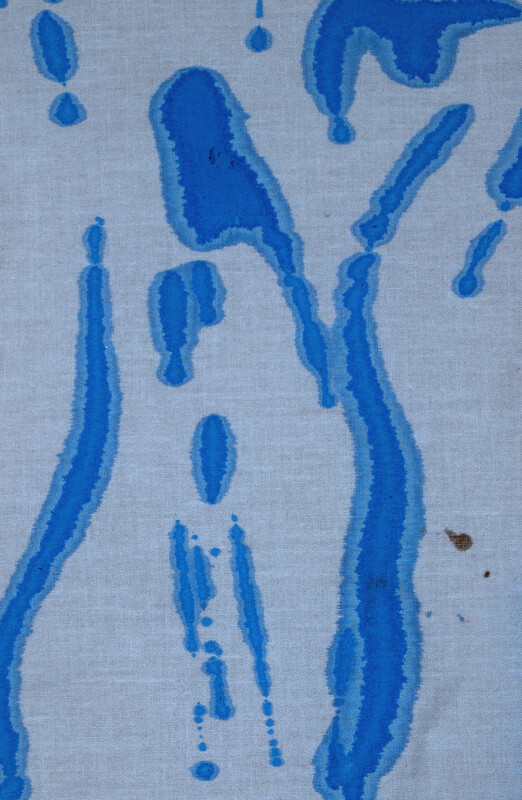 This piece shows dripping paint on dry fabric. You will get a halo effect, but beyond that, the paint does not spread. 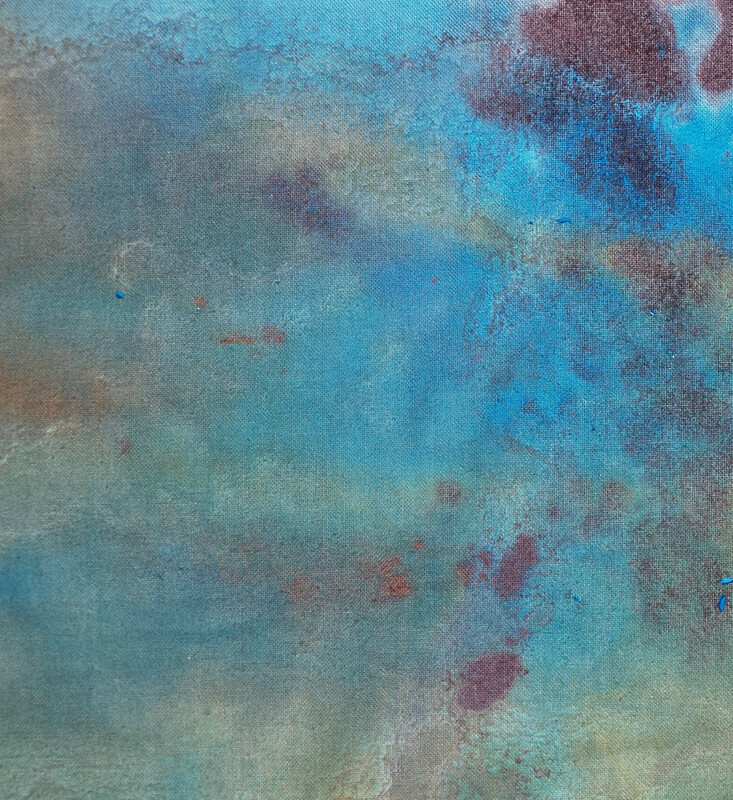 And this piece shows the result of dripping paint on wet fabric. Obviously, if the fabric is wet, there is much more blending of colors. For both pieces, the paint was diluted with water to make it “drippable”. This experiment was done with a comb (once again, the many uses of common household items). The fabric was painted orange with fairly thick paint. 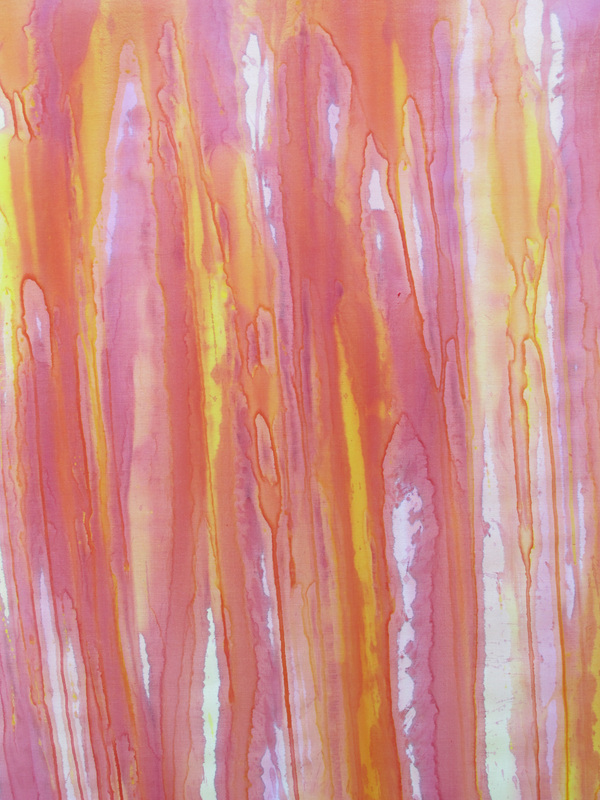 A comb was dragged through the orange paint to get the rhythmic lines. After the orange dried, diluted blue paint was brushed over the top. 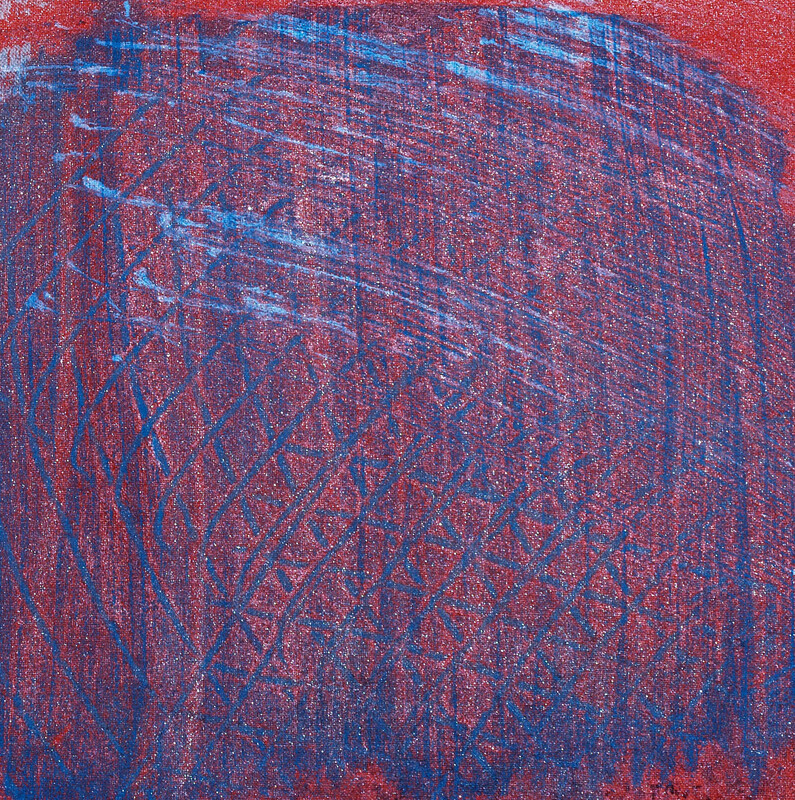 The blue paint filled the lines formed by the comb to darken that design. The white lines across the top were done with broom bristles.